My friend Julie suggested the name Tidal Pool for this bracelet, and I think that's perfect since it's decorated with pearls and features an ocean jasper stone focal! 1. 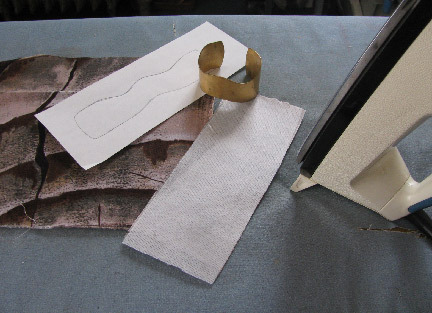 Prepare the base by drawing a rough pattern from your metal cuff and copying it onto fusible interfacing. Iron the interfacing to the back of the foundation fabric. 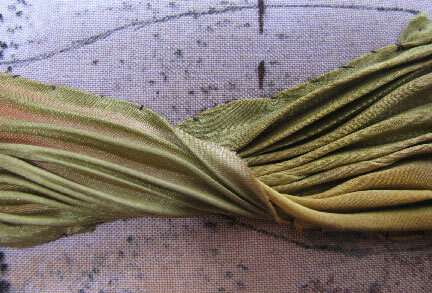 Do not cut the piece to size...leave a healthy margin because it is almost sure to shrink up a bit as you stitch. 2. Play with the ribbon, letting it flop and fold until you like the looks. 3. Tack down at one end with small stitches in the ditches. Don't worry about the thread color...your stitches will be covered by beads later. 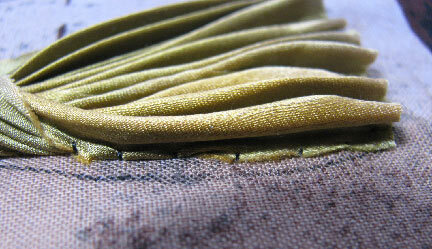 If you stitch in an area that won't be covered later, be more careful to bury your stitches inside the folds. 4. 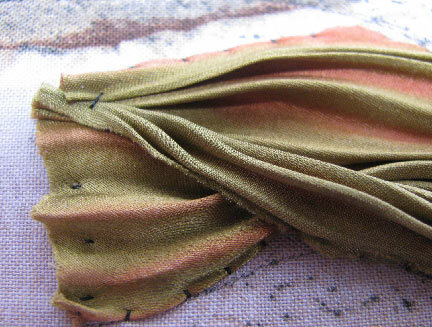 Roll the edges under along the length of the ribbon and tack down with small stitches. These will also be covered later. 5. You can twist the ribbon completely over if you like. 6. Fan out some areas of the ribbon and pinch other areas together. 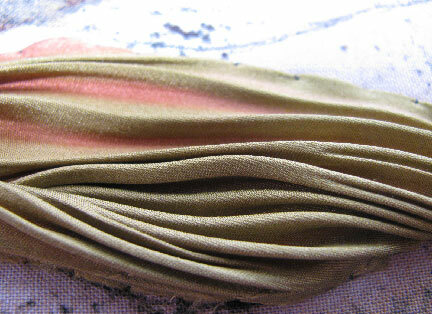 Stitch into the foundation to hold the folds and meanderings in place. 7. Instead of flipping the ribbon completely, you can twist just part of it over and tack it together (see the large stitch at the top). 8. 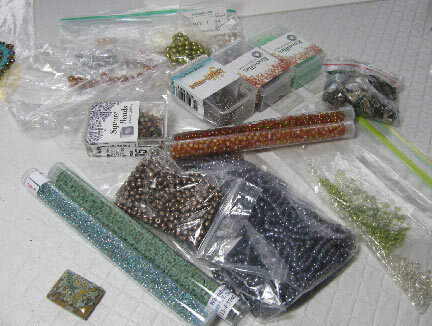 Choose focals, accents, and seed beads in colors and sizes that you might want to use. I love the cuff. 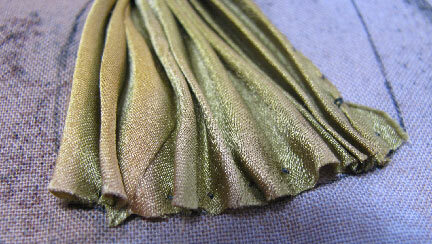 And the Shibori ribbon is just luscious! As always, your creation is so beautiful. Thanks for sharing. 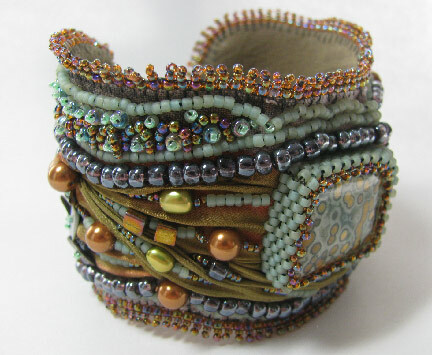 Love the look of this cuff...shibori & beads a great combo!!! Interested to see how you finished...I am assuming fold over, glue , backing...will have to check out..like I need a new project!! Thanks!! Ahh ... the secrets revealed. 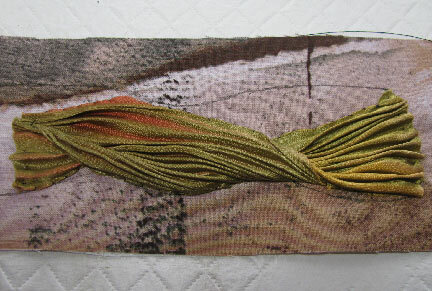 I've wondered how you do bead embroidery on something dimensional like a cuff. 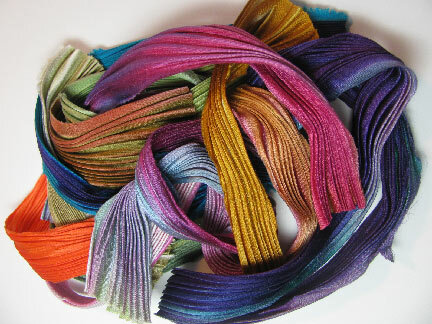 The Shibori ribbon is gorgeous. It's almost a shame to cover it up. Thank you guys, so very much. I am really happy with how this cuff came out, and the rest of the tutorial will post on Monday the 16th!